Strong, powerful words, clearly spoken by a man with a passion to protect the British way of policing from the policies and cuts being thrust upon the service by the current coalition Government. Nor were they spoken by anyone within the Police Federation, the #AntiWinsorNetwork or any of the well-known police bloggers ! 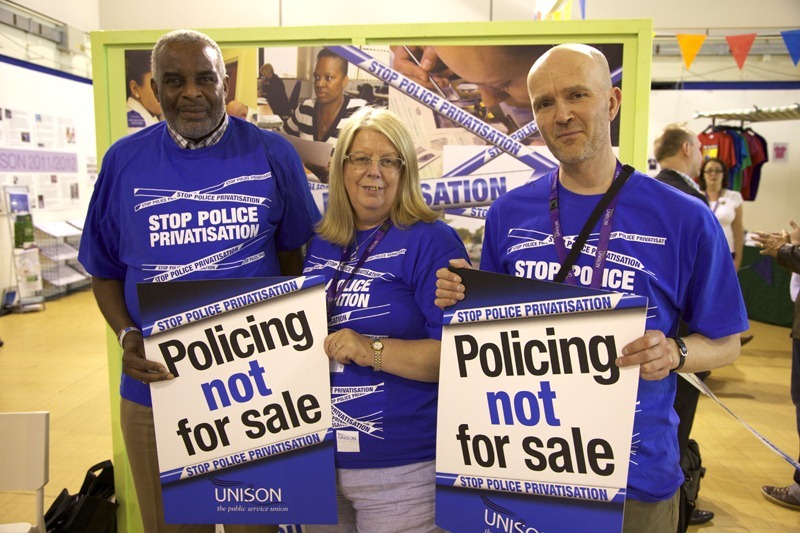 They are the words of Neville Lawrence, father of the murdered teenager Stephen Lawrence, when he addressed the Unison 2012 conference yesterday, the 22nd June. He recounted in agonising detail the events of the night in 1993 when his son Stephen Lawrence didn’t come home. Many delegates were openly crying at the dignity and graciousness of Mr Lawrence, and his evident and continuing personal suffering. Mr Lawrence then removed his jacket to reveal he was wearing a ‘Stop Police Privatisation’ T-Shirt as he began to talk about why the currents plans are so wrong. If ever there was a list of people who had a genuine reason to be aggrieved at the British police, Neville Lawrence and his family would, I’m sure, be pretty near the top, yet here was this man, with no political axe to grind, nothing to gain personally or financially, speaking out in public; pleading for the current madness to end. So I say this to you today – if Neville Lawrence is a man brave enough to put his own personal grief and experiences behind him, and after all he and his family have endured, he is still willing to stand tall, and speak publicly and passionately to support us, the British police service, shouldn’t you ??? ← Why the Police should be a Mickey Mouse outfit ! It is, quite frankly amazing, that any government would consider privatisation of the police force. The current coalition government have completely lost the plot. They have already destroyed the planning system – the NHS and police force are next on their list. Only the banks are safe. This government will go down in history as the one that has done most damage to the British way of life. Brilliant. Point well put – the sooner more people realise what is happening the better chance we have of minimising the damage being done by these out of touch twits we call a Government. To be honest, whatever our gov decide to do doesnt suprise me anymore. When i think to myself “why are they doing this?” i come up with the same answer everytime, and that answer is “because they dont care”. They dont have the English peoples interests at heart. Privatising the police is the dumbest thing ive ever heard, its about time Camerons mother stepped in and slapped his backside for being an absolute idiot, the tories WILL finish this country off. The police routinely say ‘no’ to investigating crime. Try phoning up the police and telling them your bank account has just been plundered of £500 by some unknown fraudster and see where it gets you. Or your credit card has just been stolen. These are crimes are they not? Why am I any less a victim just because the police regard it as beneath them, or too time consuming to mount a proper investigation. That might have been the last of my savings, and I’ve got nothing more for a month so all the kids go hungry. Or how about noise pollution from a house party next door at 3am when I have to start an early shift and both the kids are ill. Or a gang of feral nuisance makers throwing stones at the car. Or aggressive debt collectors for the last resident banging on the door. Who deals with any of these criminal elements right now? Not the police that’s for certain. They routinely cherry pick what they will or won’t respond to and it’s all determined by political fashion. Right now that’s anything associated with -ism or potential domestic battery. Hence why a millionaire football player who’s had some unkind words posted about him on Twitter will have an investigation mounted, long before you will if your months wages have just been drained from your bank account. If there is a market for crimes that are going un-investigated then good. I don’t care a damn how profligate the law providers get, any more than I care how profligate Sainsbury’s get from me doing the weekly shop there. As long as they get the job done, I’m happy. Just like people need to eat, they need law and order. And as the police are failing so resolutely to achieve that, then it’s time to put it up for tender. I say bring it on. At least some solution to fraud and nuisance makers is better than no solution at all.